Ah, I love the Heartstrikers! I don’t know why it took me so long to read this book. Maybe it’s because I initially thought it was going to be the final installment and I just didn’t want the series to end! 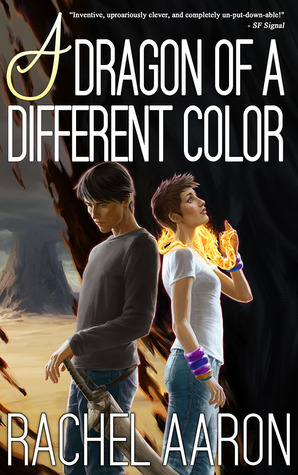 But A Dragon of a Different Color is in fact the penultimate volume, and I’m glad I finally got to read it. The story picks right up from the end of the previous book, so as always, the standard caveat applies for all my sequel reviews: spoilers for the previous books are possible, so avert thine eyes if you’re not caught up to the end of No Good Dragon Goes Unpunished yet. Once again, we meet up with our protagonist Julius, the youngest and nicest dragon of the Heartstriker family. To stop his clan from literally killing itself, Julius had set out to change the way things worked—by overthrowing his tyrannical mother, Bethesda, and forming an elected council so that none of them would have to resort to bloody violence ever again. But in accomplishing his goals, Julius has also lost so much. As the book opens, we see him mourning for the death of a dear friend. And as if that wasn’t bad enough, his grief is soon compounded by another shocking revelation about his siblings Bob and Amelia. Julius can’t bring himself to believe that Bob, the Heartstriker seer and the brother who has always been so kind to him, would commit such an unthinkable act, but the evidence doesn’t lie. It also means there are now even fewer people our protagonist can trust. Meanwhile, the powerful spirit of the lake Algonquin is stirring, and unfortunately, in the midst of all these changes, the Heartstrikers are in no state to defend themselves. It also appears that their weakness has not gone unnoticed by the Chinese dragons and their Golden Emperor, who are now seizing this opportunity to invade Heartstriker territory. But is everything truly as it seems? Julius soon learns why the Golden Emperor is so powerful and how he has reigned for so long. But the Golden Emperor has his secrets too, and clearing the air may be the Heartstrikers’ only chance to come out of this catastrophe in one piece. With so much happening in this book, it’s no wonder that there was never a dull moment and the pacing remained energetic and non-stop throughout. The narrative mainly bounced between two different threads, the first being the dramatic events occurring at Heartstriker Mountain, where Julius has his confrontation with the Golden Emperor, and the second being a more metaphysical subplot involving the afterlife and discovering what happened to the world’s magic all those centuries ago. Algonquin, who has thus far been a powerful force in the background, also gets a bigger role in this book and readers are even provided a glimpse into the events from her point of view. But for me, the highlight of this novel was everything that unfolded at Heartstriker Mountain. As fascinating as it was to learn about the history of the Merlins and magic, it couldn’t hold a candle to the emotions and action being tossed all around at Bethesda’s former stronghold. Julius puts his diplomatic talents to good use, and shows how being “nice” doesn’t necessarily have to mean being a doormat. Undoubtedly, the traumatic events of the previous novel must have taught him some lessons, because I loved how he has developed more of a backbone in this one, pushing back when the situation calls for it. But of course, in other respects, Julius is not quite so quick on the uptake. By the end of No Good Dragon Goes Unpunished, I think most readers have already figured out the big secret involving his sister Chelsie, given all the obvious hints. If you’re anything like me, then you’ve probably been impatiently waiting for the moment Julius the Oblivious finally gets it, and this book will be immensely satisfying for you. Chelsie has become one of my favorite characters, which is really incredible if you think about how she began this series as a kind of bogeyman figure for Julius, as the clan enforcer everyone feared. Now I just can’t get enough of her, and it delighted me to see her open up in some downright touching and tear-jerking moments in this novel. To be honest, aside from some of the more mystical elements got in the way of the flow sometimes, and the fact we also didn’t get to see as much of the rest of the Heartstriker family like Justin, there really weren’t too many flaws with this book. Besides, I believe that the strengths more than made up for these minor weaknesses. Everything is shaping up quite nicely for an epic finale. As sad as I am that the next book will indeed be the concluding volume, I’m making a promise to myself that this time I won’t wait as long to read it. Audiobook Comments: I’ve gone back and forth between the audio and print for this series and personally I find both formats to be equally enjoyable. After reading the print edition of the previous book, returning to Vikas Adam’s narration was a nice change of pace. I enjoyed his performance (except his Bob still sounds way too goofy for my liking, even if it’s all part of his character) and his huge range of accents and voices means he’s fantastic at making each individual’s personality stand out. Even though I bought the first book in series I still haven’t started. I think I’m now at the point where I realise I’m not going to get to this one as I’m so far behind. Which is a shame. I’ve still got the book though so you never know. I really liked this one too! Yeah, the parts with Marcy weren’t nearly as good as Julius. (I think I’d skip them in a reread) I loved learning about Chelsie’s past though. She’s so great! Haha I was amazed by how slow Julius was too. Previously he was a smart dragon… I just finished the last book. I’m so sad that it’s over! Aaron says she plans to write more in this world though so yay! One day I will start this series, in fact I have the first book on my Kindle, I believe. So glad it’s stayed strong this long, which is unusual! I own the first 2 books but even though I haven’t read them, I was under the impression this would be the last one as well. Glad it’s continuing since you like it so much! I love her science fiction novels and I can’t wait to try these as well! You’ll love them! They’re very different from her sci-fi, but if you liked M.L. Brennan’s Generation V, you should feel right at home with these.